I can say with absolute certainty I do not cheat. I am not a magician. I don't care what those schmucks think. I'm a millionaire. 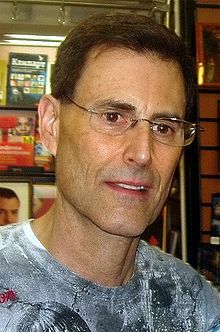 Uri Geller (born 20 December 1946) is an Israeli illusionist, well known internationally as a magician, television personality, and self-proclaimed psychic. The things that always seem to work are the things that any magician can duplicate. Randi's quite right to point that out. But that's not because I'm doing a conjuring trick. You'd think that whatever causes these things to happen doesn't want them to be proved. Colin Wilson, The Geller Phenomenon (1976), page 120. "Like I told you, I'm not a magician," he says. "If something isn't working, I don't try to guess." My boss treated me like a slave and I felt completely degraded. Then, just once, I did a terrible thing - I peed in his tea! Watching him drink it, my grudges completely dissolved - I never minded making tea for him again. OK, David. Here we are on the train to Exeter, to the football club of which I am joint chairman, and where we're doing a charity show with Michael Jackson. You and I have both demonstrated some of the hidden powers of the mind and it would be interesting to hear, David, how you explain some of your incredible achievements. I'll no longer say that I have supernatural powers. I am an entertainer. I want to do a good show. My entire character has changed. I went to a number of homes around the country, sometimes with my own spoons in my pocket, or I would select one at random from the family kitchen. Typically it was a boy under ten years of age who would lightly stroke the metal object at the narrow point of the handle while I held it between thumb and forefinger at the end of the handle. The spoon would soon slowly bend, creating two 360-degree twists in the handle, perfectly emulating what Geller demonstrated on television. No tricks, no magic potions, just innocent children (with normal children's fingers) who had not yet learned that it could not be done. (Professor John Hasted, Chairman of the Department of Physics at Birkbeck College in London, also conducted extensive experiments with children in England, as did physicist Ted Bastin. Both found numerous children who could bend the metal without any physical contact.) The evidence continued to mount in this way, suggesting that these strange capabilities were quite natural and likely common in humans, though latent and seldom manifest. It occurred to me that we were possibly seeing the emergence of an evolutionary attribute, or the residue from an earlier one that was now fading. I have never claimed that Geller was authentic, or that the Society had any opinion as to Geller's authenticity. I only said that I know of no way that he could have used trickery to do these things. That is a fact. Those responding to Geller's phenomenon by "bending forks" themselves, were following the same pattern. Their ego "roof-brain" had nothing to do with it (and they also hadn't yet learned fully enough that the act was impossible). Time did a devastating hatchet job on Uri Geller (and others). Time selected those events and circumstances thoroughly discrediting Geller. Time also grouped such meticulous researchers as Charles Tart with highly suspect and careless showmen, tarring all with the same brush. Guilt by association is hardly objective journalism. Nevertheless most "nonordinary" phenomena are subjective and not amenable to cultural "prediction and control." This has been one issue of my book. Should Geller-type material become fully acceptable within such channels of the culture such as Time, we would know that the cultural force would have absorbed, and not destroyed, the Crack-sign value of such phenomena. When those working in the field of "nonordinary" phenomena stop trying to prove to the Establishment, they will make a great leap forward. Anonymity is the direction. This page was last edited on 13 August 2018, at 14:04.